#RWC2015 - Will the hashtag help? Lancashire has been the host of the Tonga Rugby Union team this week as they have been training at the University of Central Lancashire (UCLan) in Preston. This is in preparation for their forthcoming autumn internationals, with their first game coming on Saturday against Georgia. The squad have been training at the UCLan Sports Arena in Cottam, a couple of miles from Preston City Centre and a mile from Preston Grasshoppers home ground, for the last few days using their facilities to prepare for their upcoming matches. 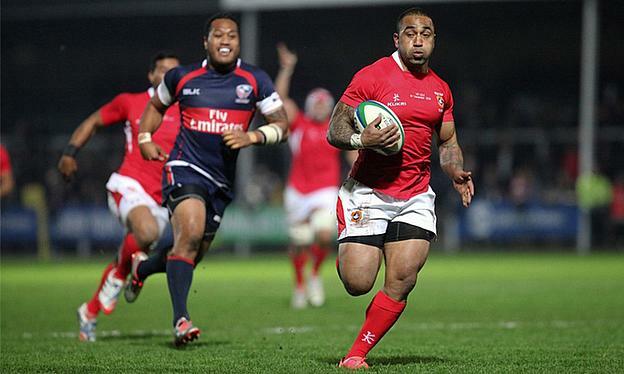 Tonga Head Coach Mana Otai said: "Training is going really well and we’re all feeling very positive. This is our first visit to Preston and the whole squad has been made to feel really welcome. We’re very impressed with the facilities here at UCLan Sports Arena and will make the most of them as we prepare for our first Autumn International match next week." Students of the university have had the chance to see some of the stars of international rugby in training sessions and the Tonga side have repaid the university’s favour. They have allowed second year sports coaching students Liam Reilly and Oliver Hicks to work alongside the team on performance analysis as well as allowing second and third year sports therapy students to provide sports message treatment. Tonga may have even caught UCLan’s Mens 2nd Rugby Union side beat the University of Chester (Warrington) Mens 1st 26-12 on Wednesday and they could well be returning to UCLan next year to use it as a base for the Rugby World Cup. In the last Rugby World Cup in New Zealand, Tonga achieved their most historical victory to date beating finalists France 19-14 in the Group Stages. They will be hoping these current autumn internationals will put them in good stead for next year as they look to reach the quarter-finals of the Rugby World Cup for the first time. Tonga are set for matches against the USA and Scotland in the next few weeks. The last time Tonga faced Scotland they achieved another bit of history as they won their first ever match against one of the big international sides on a European pitch. They have only ever won five times against tier one nations in their 91 year history which include those most recent wins against France and Scotland. They beat France again in 1999, Italy in the same year (but at the 1999 World Cup) and Australia back in 1973. They will be hoping to cause another upset this autumn.